Well y’all, today is the last day of our Come Home for Christmas blog tour series. 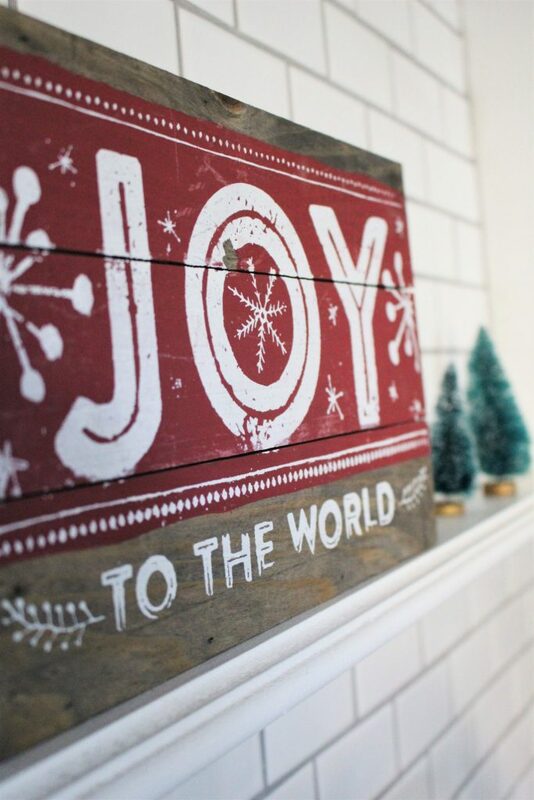 We hope you have enjoyed seeing all of the gorgeous spaces that our friends have decorated for Christmas. 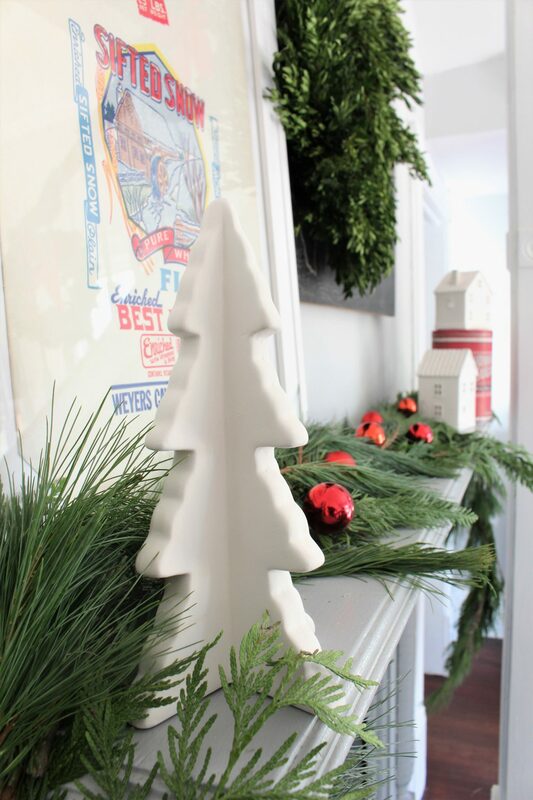 And we hope that you’ve been inspired to get creative with your decor this year. One of the things that sold me on my home a few years ago was the kitchen. It had granite countertops with a huge island, something I never had before, and white cabinets. It really was the perfect space. The only thing we had to add was the subway tile backsplash. It is such a fun space to decorate, but this is the first year I’ve really decorated the entire space for Christmas. I have to say, I love it! I have had this tiered tray for a while, a gift from mom, but never got around to utilizing it. I’m not sure why I waited so long. 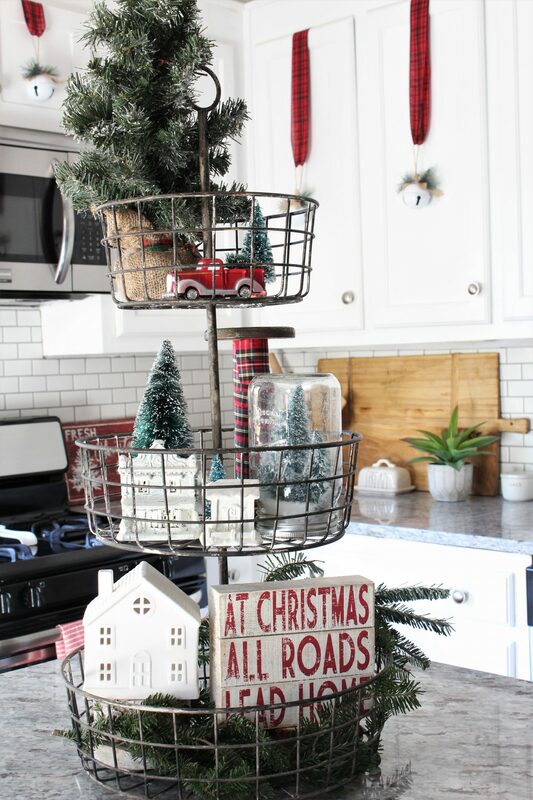 It is the perfect piece for the kitchen and love it all decorated for Christmas. If you follow us on Instagram, you may have seen that I have a slight Christmas sign problem. They are just too cute to pass up. This is one of my favorites. How cute is that little red truck? I have a few of those scattered throughout the house. Also, I love all my little mason jar Christmas vignettes. 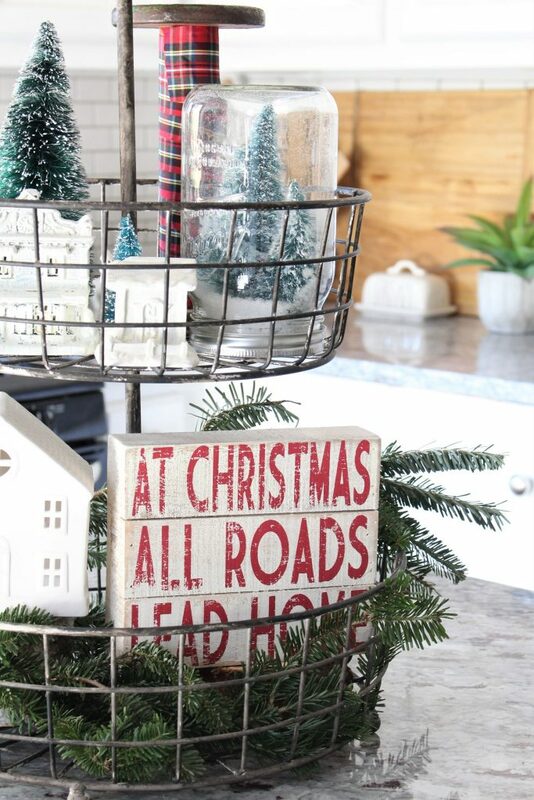 Another one of my signs…love it’s rustic charm. And I of course had to incorporate my little cow creamer. 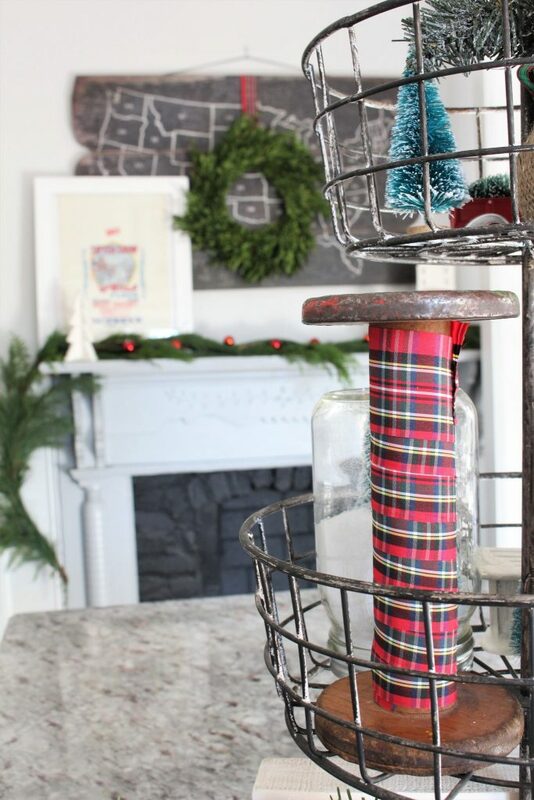 I got this spool for a great deal at an antique store and use it all the time in my decor. I wrapped a little bit of ribbon around it to give it more Christmas spirit. 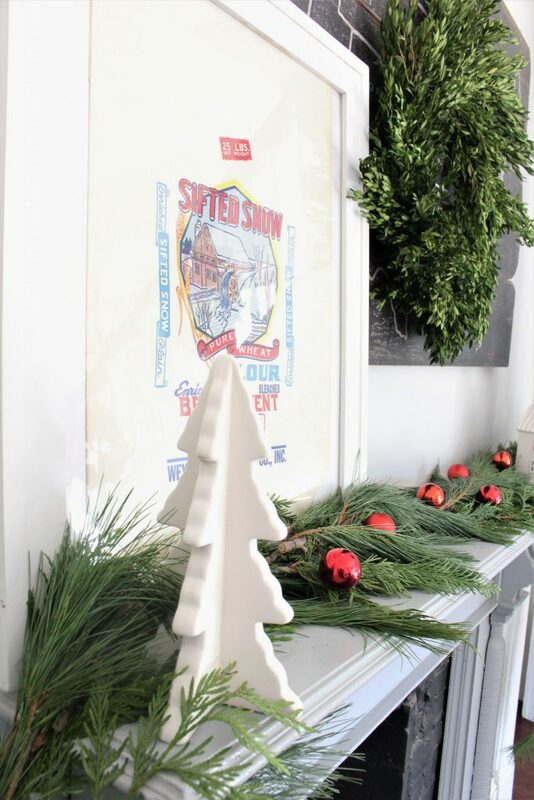 I’m very fortunate to say that my little 1901 Victorian Farmhouse has 4 beautiful original fireplaces that are so much fun to decorate. I got the boxwood wreath at Trader Joe’s. You may have seen my other one on the Christmas front porch tour. This old flour sack was a find after Christmas last year that I almost forgot about! It’s just so cute and perfect for the kitchen. 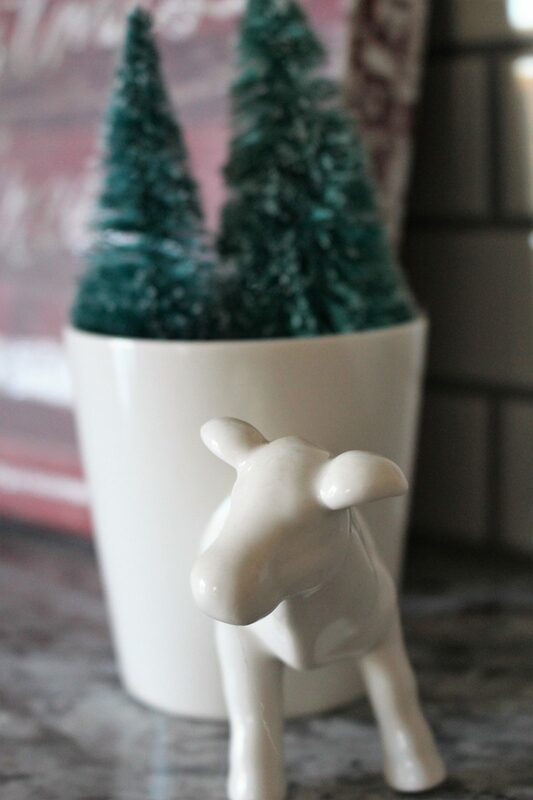 Also, I love this little ceramic tree I found at the Target Dollar Spot and am kicking myself I didn’t buy more. 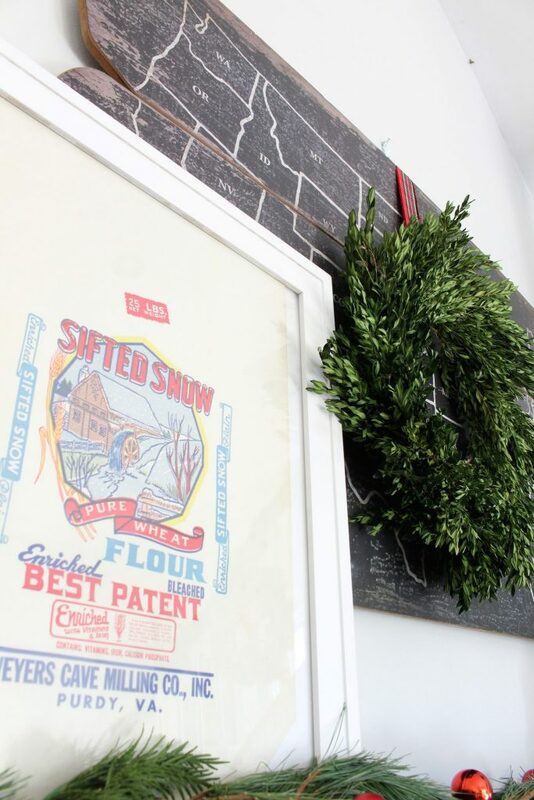 Too bad I can’t keep my Victorian Farmhouse Christmas Kitchen decor up all year long. It’s just so festive! Thank you so much for joining us on our little tour and following along! Be sure to visit the other great rooms that have been showcased throughout the week. Click all of the links below in each room, each day of the week. 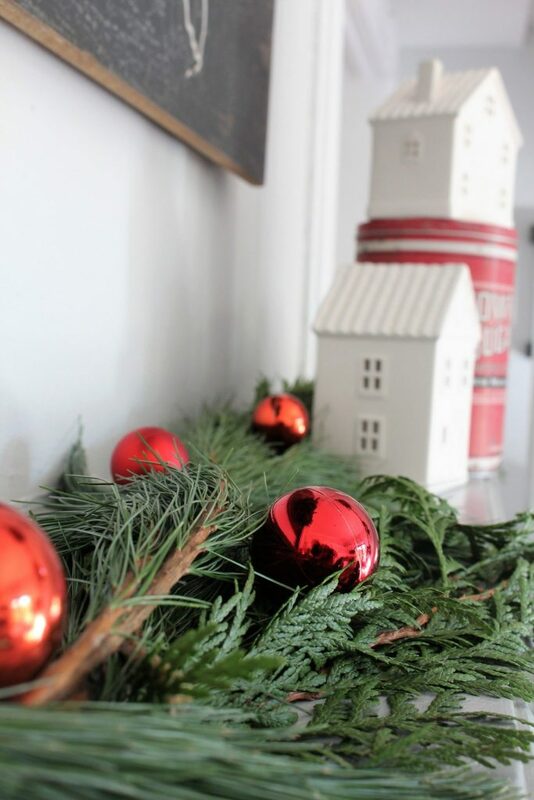 We were blown away by the amazing talent and home decor of each of the home design bloggers. You will be too! Ohmigosh! I LOVE your kitchen!!!! Not only is downright beautiful, but your decorations make my heart sing. Thank you so much for hosting this hop! So festive for sure. I have a sign addiction myself, big, little and in-between. I also have a tiered stand that I don’t do a thing with but move it from room to room to get it out of the way. I will try decorating it for Christmas, but I really like yours better, tell your mom she picked a nice one. SO pretty and ready for Christmas! 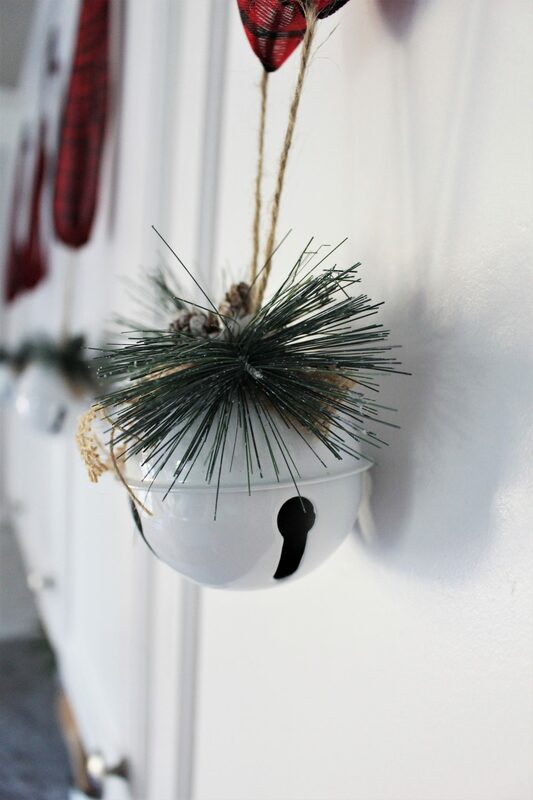 Those dollar store bells seriously give the room the finishing touch on your cabinets – I love them! And oh how I would die for 4!! fireplaces. A wonderful display of Christmas spirit. 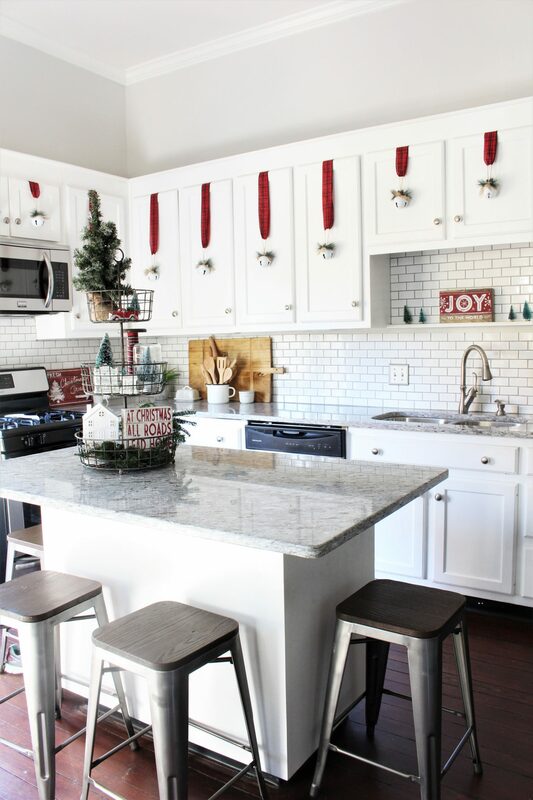 Your kitchen looks absolutely beautiful decorated for Christmas Jenn! 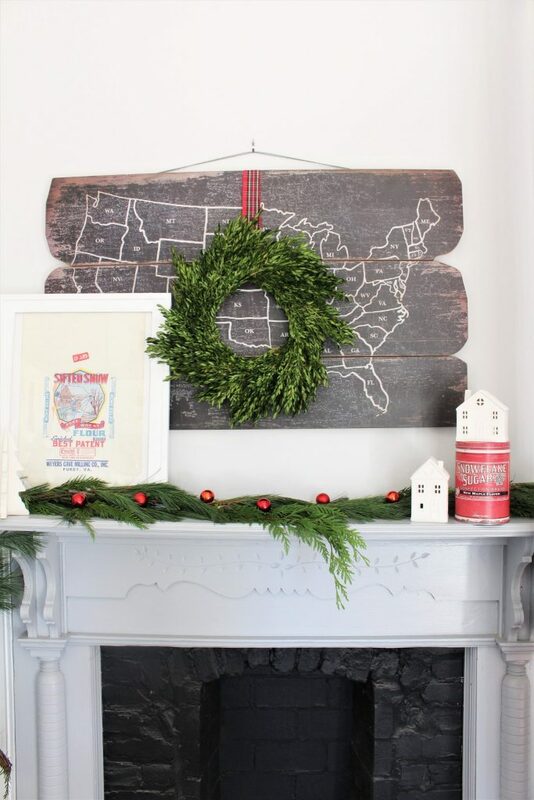 Love how you decorated your fireplace mantel with the boxwood wreath! thanks so much for all yours and your moms hard work on this fun Christmas hop! Jenn! All the details equals all the feels! 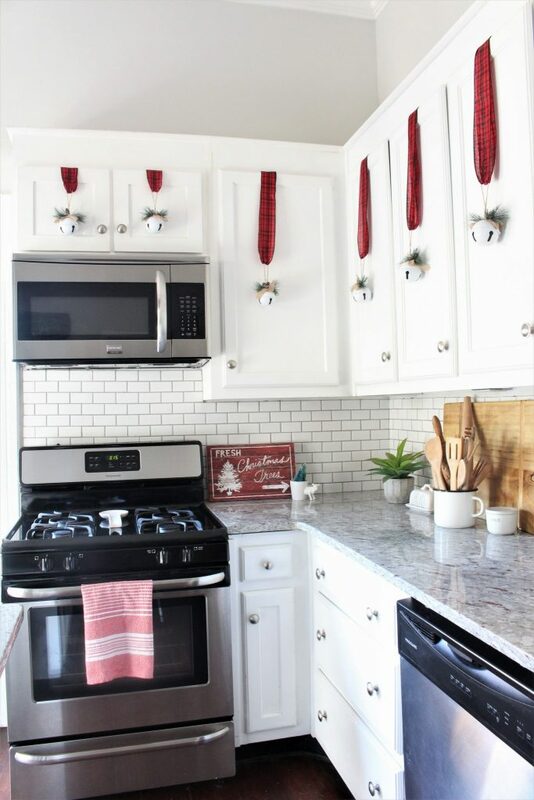 I love those bells hanging from your cabinets. 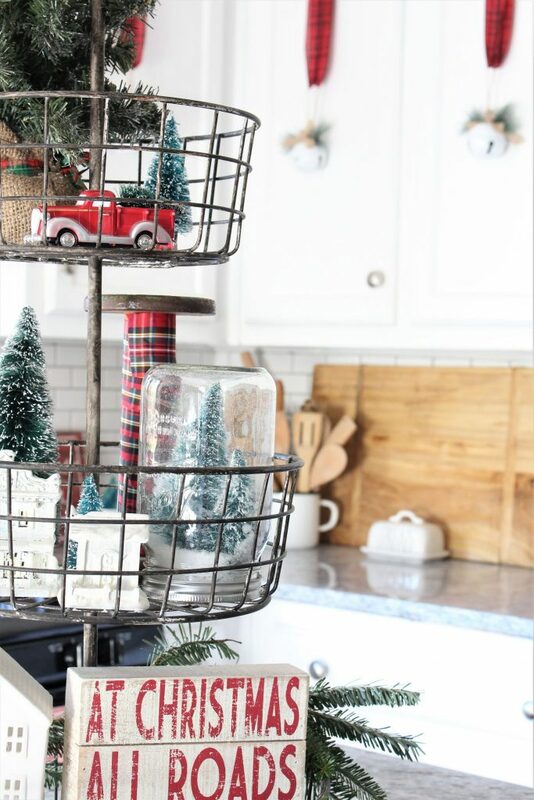 And I always struggle styling tiered trays – I’m drawing so much inspiration from yours! Thank you for all your hard work putting this together! I have had so much fun visiting all these other bloggers homes. Jenn, I love your kitchen. Those bells are great. We have only one dollar store in our small town and it never has the great stuff everyone else finds. Your kitchen is so pretty!!! 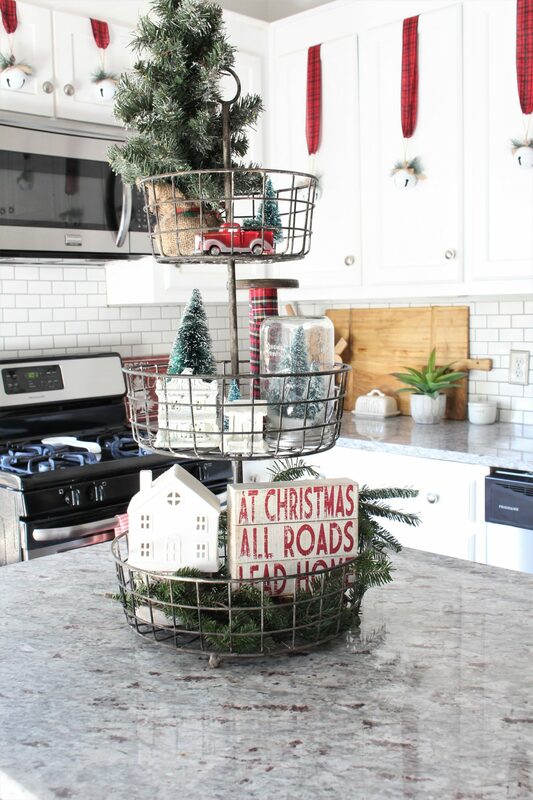 The tiered stand is styled perfectly for the holidays!!! Everything looks SO pretty! And oh my gosh, those jingle bells on the cabinet! LOVE it all! I can see why the kitchen sold you, it’s a beautiful space and so festive with your holiday touches. Love it all! Thanks so much for including me in your tour and for all the hard work you and your mom did putting it together. Happy Holidays! What a gorgeous kitchen! 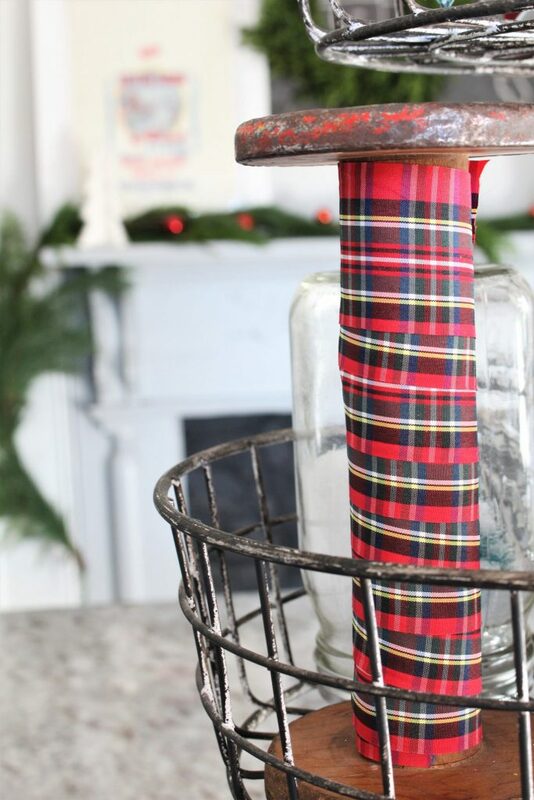 Love the DT bells you found and how you mixed old things with new. Perfect blend for an old home like yours! Beautiful. I love your kitchen!! The bells and ribbon on the cabinets are gorgeous, and I love that tiered tray! Thanks for organizing such a fun hop! So beautiful!!! 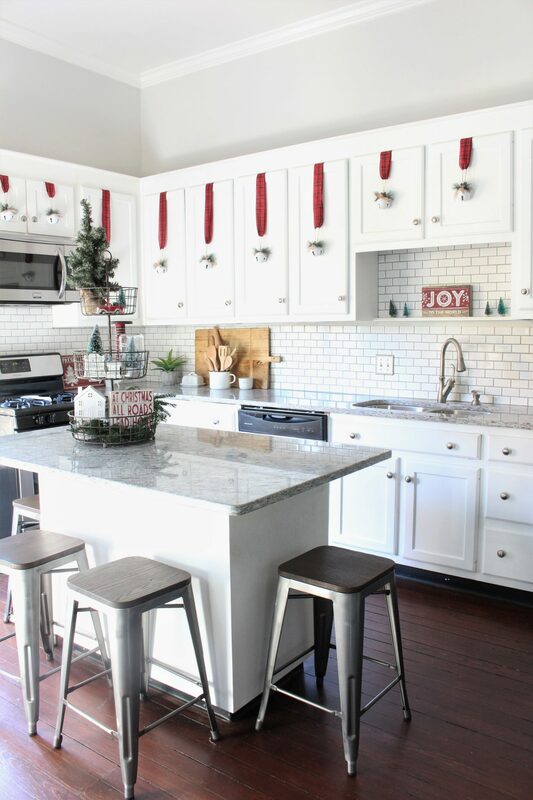 I love the classic color scheme and absolutely adore the bells on the cabinets!!! Such a cute idea! Love, love, love! The bells on the doors are stunning and, don’t worry, I have a Christmas sign problem too. They are just so cute and fun! Jenn, your kitchen is SOOOO amazing! And, those bells! I love every detail. Thank you for including me in this lovely holiday tour. Happy Holidays! Oh Jenn, your kitchen is amazing! I wouldn’t be able to bear taking those decorations down after Christmas either! And I’m a bit jealous of your awesome original kitchen fireplace – what a cool detail! Thank you so much for organizing this hop; I’ve really enjoyed seeing all our group’s different rooms and decorating styles! So many gorgeous details in this space! My eyes are in heaven! Loving the red decor mixed with the greenery. 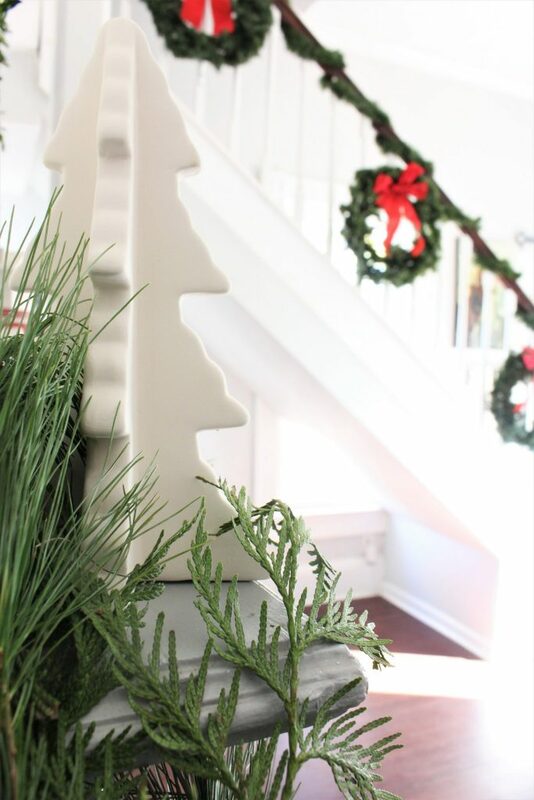 Such a refreshing take on the traditional Christmas colors. Beautiful job, friend!